Dark Eye Glasses Not Required. I’ve been changing my drinking habits lately. Running around trying to grab every beer that one has never tried is a young man’s game, and I just don’t seem to have the energy for it like I used to. And yes, you can do the logic problem and conclude that I’m not a young man anymore. Instead, I’ve been grabbing some local beers off the shelf and just kind of hanging out with them. Whether it be a six pack over a long weekend, or a couple (or maybe three) over a period of a couple of weeks (or months). 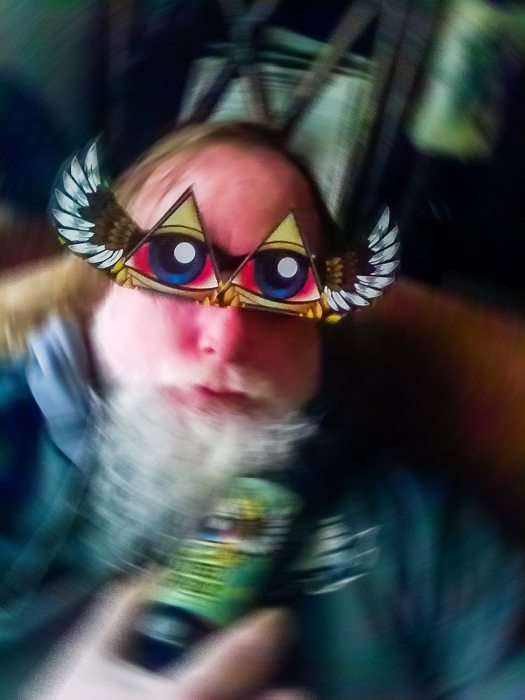 I’ve been just hanging out with the beer, kicking back, relaxing, experiencing it at different times and in different situations, while trying not to let too many other beers distract me. What is this beer? Does it have a story? Does the story change over time? Will this improve my reviews? Probably not. But they’ll be changing a bit as well as the wordy intros will probably be whittled down to a few words so that the review is more concise and quicker for you to read. I also want to use this beer ‘quality time’ to take some photos of the beer and let you all have a peek at what the beer and I are doing in our lives. And the truth is, I’d rather be playing in Lightroom and Photoshop lately than writing long, rambling reviews. 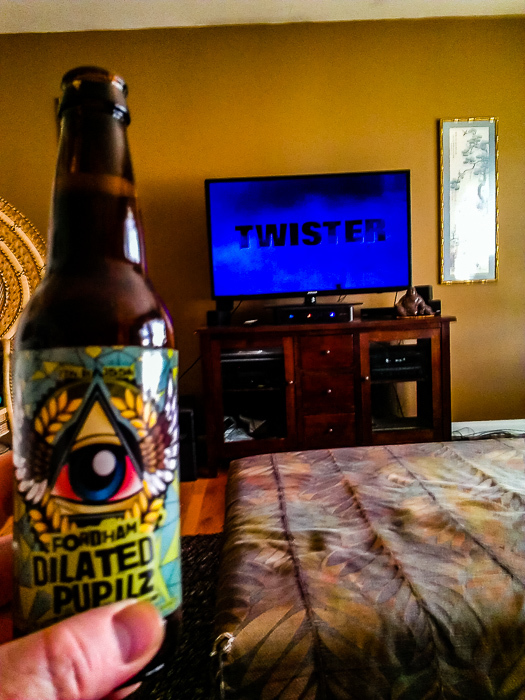 So with that, let’s check out the first beer in this new format, Fordham Brewing’s Dilated Pupilz. The grain bill includes Vienna and Caraform malts, while Bravo, Tradition and Saaz hops balance the load. Pupilz clocks in at 5.0%ABV and 38IBU. ME: As you can see by the below photos I’ve been drinking this one for a little while now. I’ve found it mostly to be a beer that drinks pretty nice in most situations without demanding too much attention on itself. When stored in my super turbo beer over-chiller (aka, my fridge) Pupilz has a clean nose and a just apparent malt taste with some classic Pilsner hop flavors. Every now and then the beer tosses me a citrusy/lemon notes towards the end, not sure if that’s really there, or if it’s my palate doing some of that slight-of-hand stuff that it does sometimes. The end is pretty crisp and doesn’t linger. I wasn’t sure I liked this beer at first, but in the end it really started to grow on me. In fact, once I had everything I needed for this review, I found myself picking up one last six-pack – you know, just for the hell of it. As always click on a photo to enlarge and cycle through the gallery to read a little comment or two about each photo. Last major snow storm of the year – last major snow clean up. 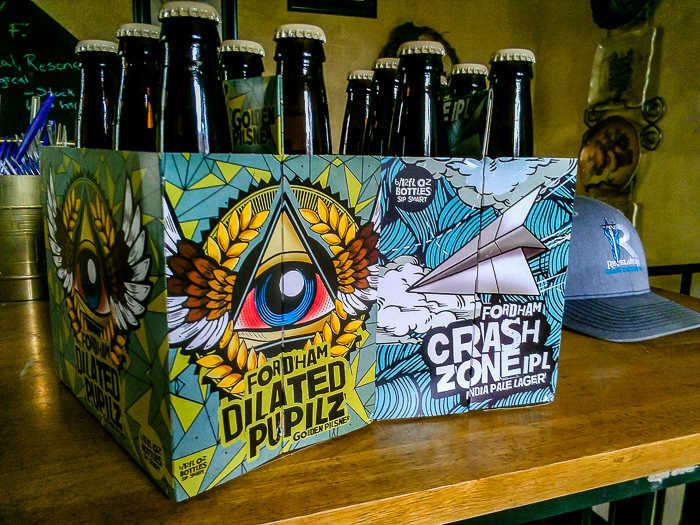 Dilated Pupilz is just the name, not the side effects, but still drink responsibly. Of course after the snow finally thawed it was time to start leaf detail. 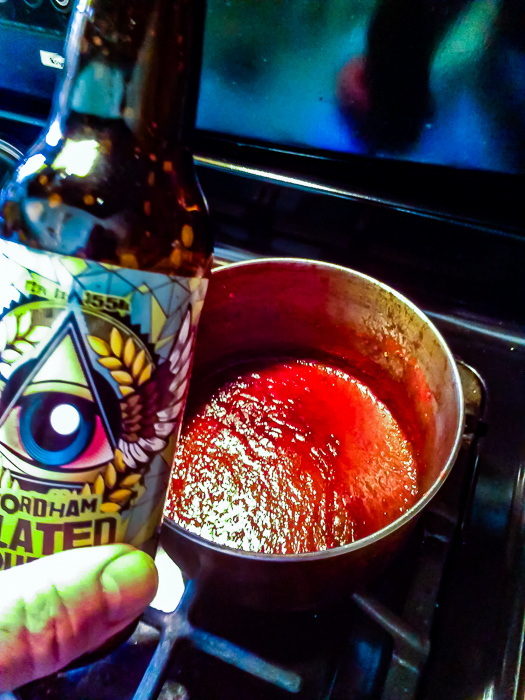 A little simmerinig tomato sauce on a Sunday, along with a beer or two. I was sad to hear that Bill Paxton passed away so I grabbed a beer and cued up one of my favorite movies. A pleasant surprise finding them both at my local. Well this is a first here at tDoB. I posted a preview of Hogs and Hops on Friday, attended the event on Saturday and here I am today posting the rundown only a few days later. Usually I’m no where near this on the ball. Oh, and as a TOTAL aside, this is my 200th post. Anyway, as I said in my preview, a lot has changed since the inaugural event last year. First, let me say that although it is a little bit more of a drive for us, the new digs at Harrington were awesome. Plenty of room for the competitors, the food/beverage trucks and the vendors; plus a huge open field in front of a good sized bandstand. We got there a little bit before they could start serving/pouring so after we surveyed the area, we decided to take a moment to walk down the BBQ truck line and see what everyone had to offer. 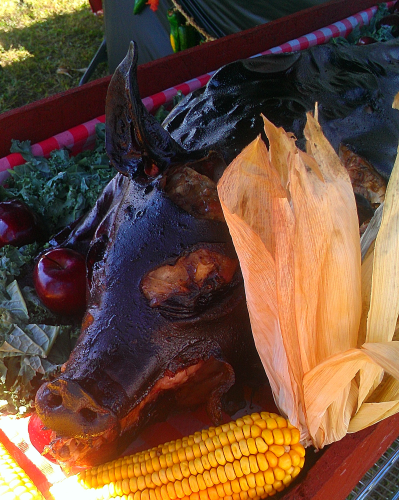 The whole hog that was part of the VIP food plate from Mr. BAR-B-CUE. I’ll be seeing this guy later. Soon it was time for the event to start so we checked out the three beer trucks to see who had what on tap. I started with an Old Dominion Monk Czech and Tracey started with a Fordham Wisteria Wheat. With beer in hand we strolled around the venue and checked out the vendors. We finally got the chance to meet Cindy Small of the Kent County & Greater Dover, Delaware Convention and Visitors Bureau, who were there promoting their up coming Delaware Wine and Beer Festival. I’ve done some promoting for Cindy, but this is the first time we’d met. It was great to relax a bit and get to talk about the up coming festival. But soon it was time for lunch. 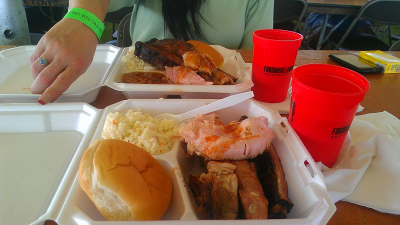 VIP ticket holders were served a BBQ platter from Mr. BAR-B-CUE which consisted of two out of three choices: brisket, whole hog pork or ribs. I told you I’d see that hog later. It wasn’t long before the bandstand got rocking, as Tyler Toliver and perennial local favorites Love, Seed, Mamma, Jump supplied the music for the afternoon and early evening. Entertainment was also provided by the folks from Cowboy Up Saloon, who not only set up a fine tent, but got some of the crowd up for country line dance lessons and demonstrations in between sets. 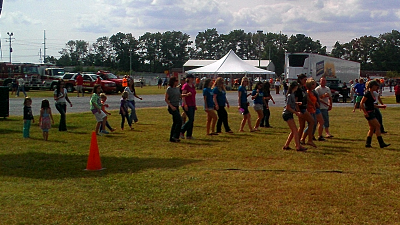 The ladies from the Cowboy Up Saloon get the crowd involved in some line dancing. “Pit row” as I like to call it was fun as always. As first all we could do was enjoy the smell of smoke wood in the air, and drool over all the different equipment that the teams brought (we were asked not to bother the teams until turn-ins were done). I always enjoy checking out the teams’ equipment, because you never know when you might see something you’ve never seen before. It’s not unusual to be using water in a Blackwood Smoker, but I’ve never seen anyone use an adapter to constantly feed apple juice from a 5-Gallon water bottle like Biker BBQ from Millville NJ. And of course, many of them used the opportunity to show off. Soon it was the time everyone was waiting for, the awards presentations. The field topped out at 45 BBQ teams from the surrounding area and as far away as North Carolina. 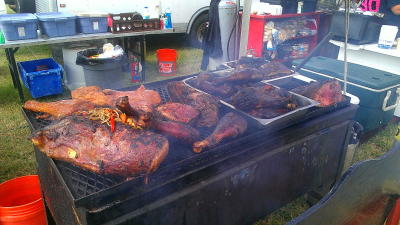 The event consisted of four meat turn-ins: chicken, pork, ribs and brisket. The top ten in each category were awarded, along with reserve champion (second place all around points) and grand champion (first place). 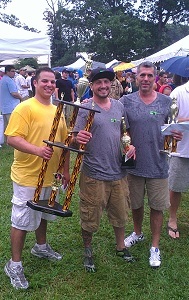 The Mid Atlantic BBQ Association was on hand as well to award the highest placed team from Delaware as “Delaware State Champion”. 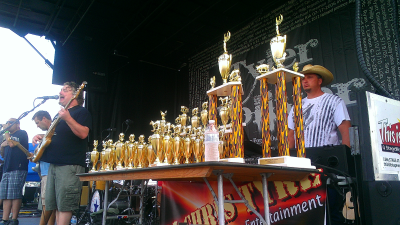 The trophies stand ready as Love, Seed, Momma, Jump finishes their set. 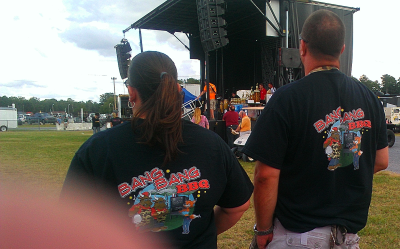 Kim and George Przybylski of Bang Bang BBQ; and my finger wait to hear if they’ve matched last year’s performance. And if everything works out, we’ll be there next year. 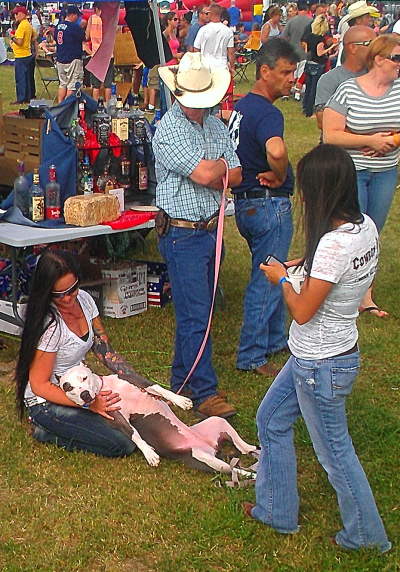 After all, what dog doesn’t love a BBQ festival? 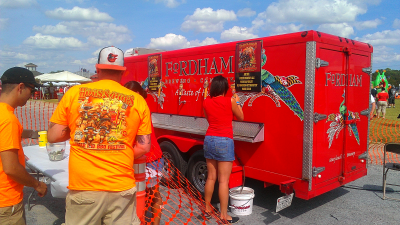 Last year I had the pleasure of attending the first annual Hogs and Hops (H&H) beer event and BBQ competition hosted by Fordham Brewery and Old Dominion under the shadow of their brewery itself. And it didn’t take but a couple of hours of sipping on a beer while walking through the rows of smokers, the aroma of hickory, apple and other smoke woods wafting in the breeze; for this to become my favorite annual event. Yeah, that’s right. The event struck a chord with me almost immediately. And apparently I wasn’t the only one. Event founder Mark Hoffman organized what I’m sure he considered going into that Saturday to be a very successful event. Hogs and Hops was designed as a combination beer event and competition BBQ whose proceeds benefited the local FOP’s emergency relief fund. 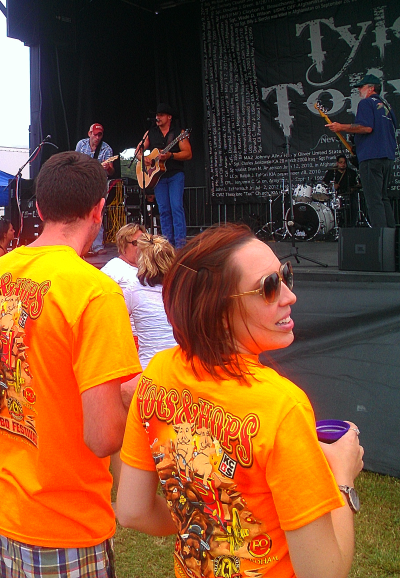 Twenty-four BBQ teams signed up to compete and advanced tickets sales were brisk, topping out at approximately 1000. So no doubt Mark was sure they had succeeded in generating a good buzz about the event. Then suddenly (and admittedly not so suddenly) something happened. The day of the event walk-up sales quickly reached the advanced sales, doubling the crowd and causing the event to outgrow its venue in the first year, which resulted in the competition being moved to the Delaware State Fairgrounds in Harrington. The crowd consumed 44 half kegs of beer and made it obvious that more beer trucks would be needed to alleviate the long lines (although to be fair, I didn’t think they were that bad). Not long after the event, Mark reached out to the Kansas City Barbecue Society (KCBS) and was able to get the event sanctioned as an official KCBS event, only the second such event in the state of Delaware. Governor Markell then signed a proclamation back in May designating Hogs and Hops as a Delaware State Championship barbecue event, again only the second in the state. This Saturday, marks the second annual Hogs and Hops and the event looks amazing. The competition field has almost doubled to the event’s maximum (KCBS set the limit at 50), drawing BBQ competition teams from the Mid-Atlantic region and several from other parts of the US. 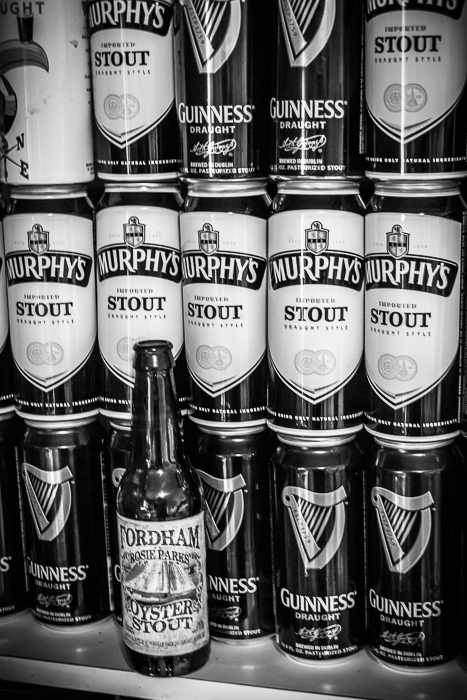 Fordham and Old Dominion are again supplying the beer this year, tapping Rams Head Ipa, Victory Lager, Copperhead Ale, Spiced Harvest Ale, Wisteria Wheat, Morning Glory Espresso Stout, Double D Ipa, Gigi’s Farmhouse Ale, Monk Czeck, Oak Barrel Stout, Octoberfest and for the kids and designated drivers, Old Fashioned Root Beer. Because of regulations, the people’s choice award got shelved (hopefully only for this year), but VIP ticket holders will still get a chance to try competition BBQ in the form of food presented by Milford, Delaware competition team Mr. BAR-B-QUE. But they aren’t the only team representing Delaware this weekend (some teams had very little if any website or social media presence so if I’ve inadvertently missed someone, I’m sorry). TFFBBQ (Wilmington), Big Bang BBQ (also Wilmington, last year’s H&Hs 1st in ribs and 2nd overall), Slower Lower BBQ (Milton), Pigheaded BBQ (Middletown), Gone Hoggin’ (Bear, who I’ll be rooting for because in their Bios they list their favorite competition food as “beer”) along with That Guy BBQ and Rub Me Tender BBQ (both from Smyrna) will be hoping to cook their way into H&H’s first Grand Championship. And why not? 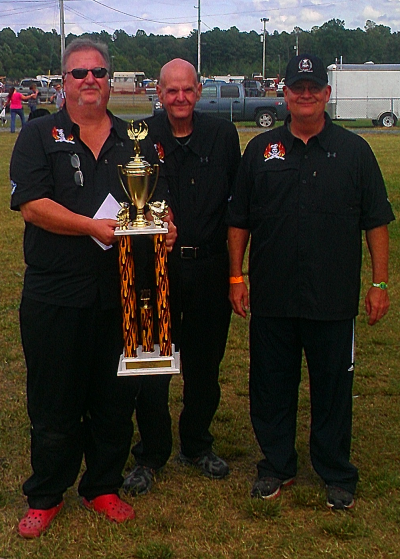 The highest scoring team from Delaware will be named Delaware BBQ Team of the Year by the Mid-Atlantic BBQ Association (MABA). On top of that, due to the sanctioning by the KCBS and Governor Markell’s proclamation, the Hogs and Hops winner (regardless of state) will represent Delaware at the Jack Daniels World Championship Invitational in Lynchburg, Tenn. Well not this year. And maybe not next year. Or the next. 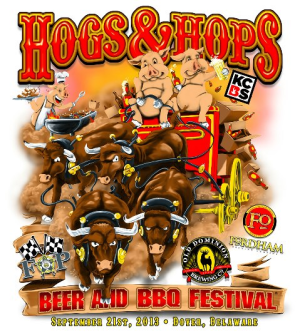 See, as I said Hogs and Hops is the second KCBS event and the second Delaware State Championship barbecue event. 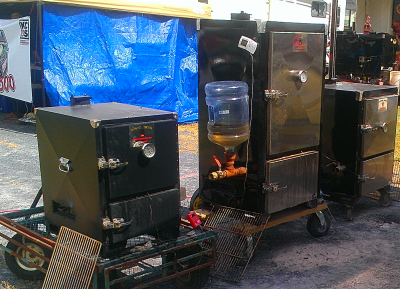 The first is the Middletown BBQ Cook-Off which just celebrated its fourth year and attracts over 50 competition teams. Because of its solo State Championship status over the last three years (as well as this year, I guess they figured it wasn’t fair to do it this year since Markell signed the proclamation only weeks before the winner of Middletown was crowned) the winner of the Middletown Cook-Off was the undisputed representative of Delaware at Lynchburg. But starting next year, the winning teams from Middletown and Hogs and Hops will compete for the honor of representing our state. What will that competition entail? I don’t know right now, but I wouldn’t be surprised if it involves some large chunks of meat and some smoke. One person who is probably very aware of the situation is David Marks, owner of the Famous Dave’s BBQ Restaurant franchise and pitmaster for Wilbur’s Revenge BBQ Team, this year’s Middletown Grand Champion. Dave’s team will be on hand at Hogs and Hops and no doubt would love to walk away with a second Grand Championship, a claim to the undisputed Delaware BBQ Champion title (that doesn’t exist but it should!) and set the tone for next year’s round of competitions. 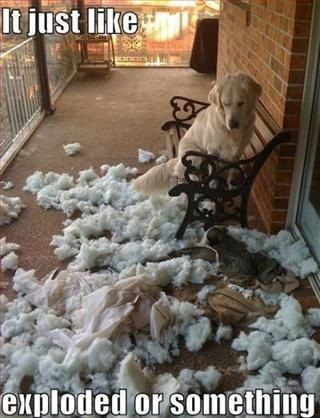 But he’s not the only big dog in the yard. 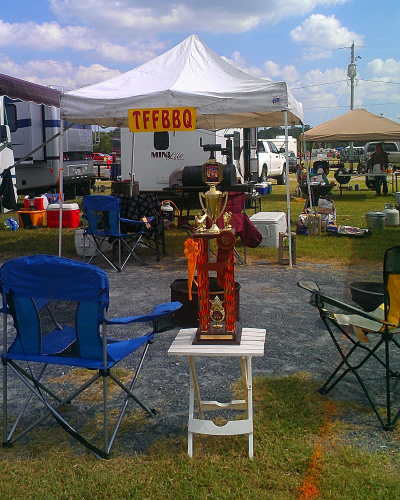 There’s a lot of great teams in the field this year, including 3 EYZ BBQ (2012 KCBS and MABA Team of the Year, current MABA points leader for 2013 Team of the Year) led by Dan Hixon; two time Pennsylvania State Champions LO’ N SLO’ BBQ led by Tom Perelka; and Hawg Nation (Pennsylvania state brisket champions three years running and MABA Team of the Year for brisket in 2012) led by Michael Czajka. Sadly, it looks like last year’s winners Alpha-Q-Up will not be returning to defend their title. So Saturday I’ll be strolling around rows of smokers again. The smell of smoke wood permeating the air (and my hair, it will probably take a shower or two to get it all out), sipping on a cold beer and discussing BBQ with some very knowledgeable competitive pitmasters (we’ve been asked to hold back from talking with the competitors this year until 3:00 due to the later turn in time from last year. I have a suspicion that the real party will start at 3:15). It probably would inspire me to do a little smoking myself on Sunday, if my smoker hadn’t nearly collapsed to the deck during my last smoking session. Good luck to all the competitors on Saturday, I’m sure you’ll do Delaware proud. And to Mark, Fordham and Old Dominion Breweries, all the volunteers and sponsors; thanks again for putting on an amazing event. See you there! Delaware. Or as some people like to joke, DelaWHERE? My own little 2,490 square mile slice of craft beer USA that a lot of people just can’t seem to figure out. A bizarre contour that allows me to visit three other states (NJ, MD, PA) by traveling only 20 minutes from where I live, but yet I could get to Max’s Taphouse in Baltimore to enjoy a DFH beer quicker than I could drive down to the brewpub in Rehobeth to drink one (and depending on traffic, some days I could make Blind Tiger in NYC faster as well). The state that brought you George Thorogood, Dallas Green, “Sugar Ray” Leonard, Valerie Bertinelli, our current Vice-President Joe Biden (I leave you to decide if you should be thanking us for that), and more Du Ponts than you can fling a Teflon frying pan at. I would tell people all the time that from a craft beer perspective, Delaware was a pretty great place to live. Washington, Baltimore and NYC with all their breweries and craft beer bars are only day trips away. Pennsylvania has a nice collection of brewers dotted over its south-east corner, all within a short distance. But within the last 15 or so years, Delaware has been slowly building into to craft beer force of its own. We now claim home to industry giant Dogfish Head, to Argilla Brewing, which head brewer Steve Powell started in a family pizza business with a 1.5 barrel system – to everything in between. Oh, we’ve stumbled along the way. Marty Haugh worked hard to get the laws changed in Delaware so that he could open up the state’s first microbrewery Rockford Brewing, only to see the business not take hold, and sadly eventually close. Brandywine Brewing flourished for awhile, even opening a second location in the heart of Wilmington only to eventually fall by the way side. Downtown Brewing came and went. But as the resurgence of craft beer began, establishments did start to take a major foot hold. Stewarts Brewing survived and still enjoys a healthy business today, recently celebrating their 18th birthday. Iron Hill started what would soon become a 9 location mini-chain in Newark. 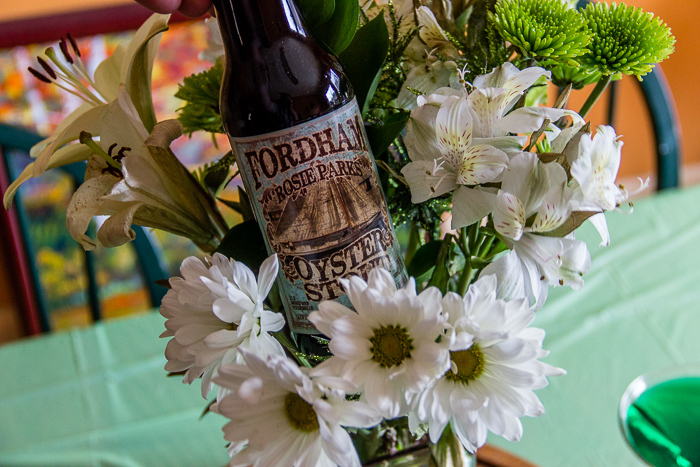 Old Dominion and Fordham joined forces to become a major brewing entity in Dover. Twin Lakes, Evolution and 16-Mile all opened and remain active. And when Evolution stepped over the state line into Maryland, 3rd Wave filled the void it created, literally moving into Evolution’s old building. And right now, Mispillion River and Smokestack Lightening are working hard at their start-up breweries. Yes, I think from a craft beer perspective Delaware is a pretty nice place to live. So when Bryan over at This Is Why I’m Drunk asked me to participate in his Six-Pack Project, I gladly accepted. The format is very simple. I’m tasked with creating a “Delaware Craft Beer” six-pack. The beers should best represent Delaware brewing and her culture. I can only select shelf product – meaning no keg-only beers. The shelf product can be any form or size I wish. Current seasonals are OK, but in general they’re discouraged. Sound easy? Let’s find out. Ok, I know what you’re thinking “well of course he’s going to include DFH”. Guilty, although I’m going with this beer for a reason. Delaware is know as the “First State”, and Delawareans hold that description very dearly. It was the first state to ratify the United States Constitution (which is where the nickname comes from), it was the first state to fly the Stars and Strips, held the first beauty contest, introduced the first Christmas Seals, passed the first Coastal Zone Act and (to my knowledge) the first state to tell another state to go F*@& itself (sorry PA, nothing but love for you). So with that in mind, any discussion of Delaware beer should include Shelter Pale Ale, as it was the first beer brewed by Sam Calagione at his Rehoboth Beach brewpub. But sadly, DFH apparently not longer bottles Shelter Pale Ale, which is fine because I want to talk about 90 Minute IPA anyway. 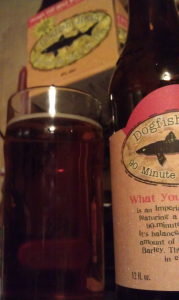 Although it seems a little backwards, 90M IPA proceeded it’s thirty minute shorter brother 60M IPA onto the market by two years, making it the first (there’s that word again) in what would be DFH’s continuously hopped series. 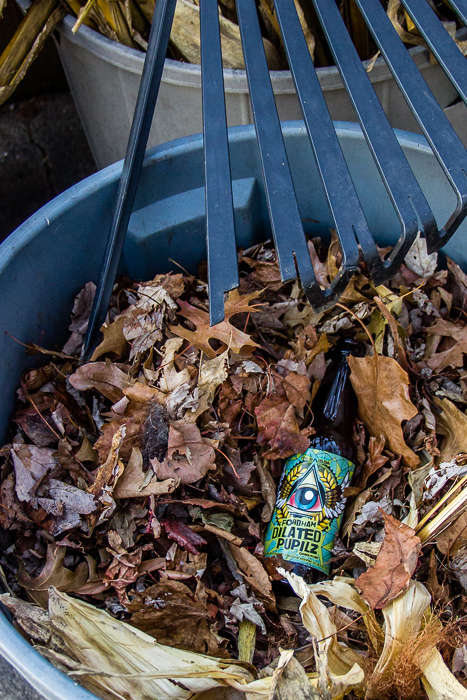 The concept that started it was simple, continually introduce hops throughout the 90 minute boil. Oh, and just to keep the theme going, have it clock in at 90 IBUs and 9.0%ABV. The fact that this beer has a mixture of hops continuously added to it for 90 minutes (plus dry hopping) would make one think that this thing is just hop water. Don’t buy it. Not for a second. It is…ah, I don’t want to say it…hop forward, with notes of citrus and resin in the nose and flavor. But there’s enough malt to balance everything out, and dangerously hide the 9% ABV. I’ve always thought the continuously hopped beers had a smoothness to them. A mouth feel on the palette that borders on creamy. There’s a slight hop prick (which is about four notches below a burn) in the cheeks and a crisp, lingering finish. An IPA lovers IPA . In this regard Delaware Craft Breweries (along with beer bars) excel. – Fordam/Old Dominion partner every year for Hogs and Hops which last year raised $15,000 for the local FOP’s emergency relief fund. – Argilla Brewing partnered with BELVEDERE FIRE CO during their Fall Festival to help raise funds for the local fire company. – Twin Lakes host The Wilmington Burger Battle which benefits the Emmanuel Dining Room a local program that feeds the needy. – Two Stones Pub hosts the “Giving on Tap” which benefits the local Meals on Wheels program. In that tradition I offer you Responders Ale. Brewed by 16-Mile Brewery (which gets its name because it’s Georgetown location is 16 miles from anywhere in the county it resides in) an English styled ale with a touch of wheat that is clean and drinkable, with notes of hay and citrus. I’m not going to lie, this beer isn’t going to blow you away with it’s light biscuit/cracker base and mild, but balance hops, but it’s nicely constructed, and has a very pleasant aftertaste. 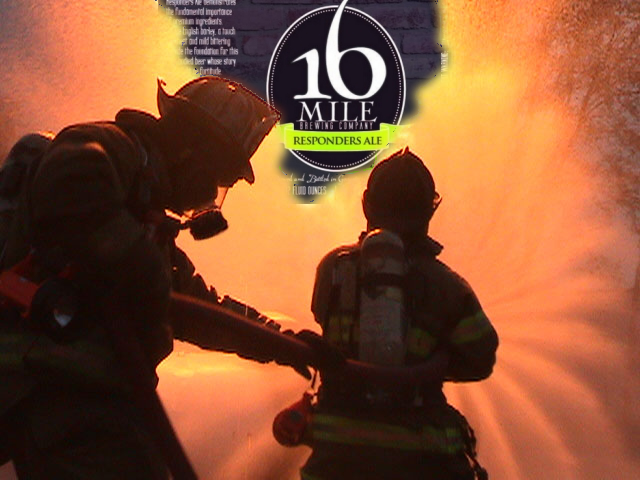 In the spirit of the BA’s statement, $3 from every case and $5 from every keg of Responders Ale is donated to the National Fallen Fire Fighers Foundation. With the Wilmington Blue Rocks minor league baseball team, The University of Delaware football team, and two major NASCAR events; Delawareans are no strangers to tailgating. And although we may not be spoken in the same breath as Kansas City, Memphis, etc; we’re no slouches when it comes to the backyard cookout or barbecue either. But as everyone knows, when you get your friends together for some grill/cookout type food, you should have a good beer to go with it. Enter Greenville Pale Ale. 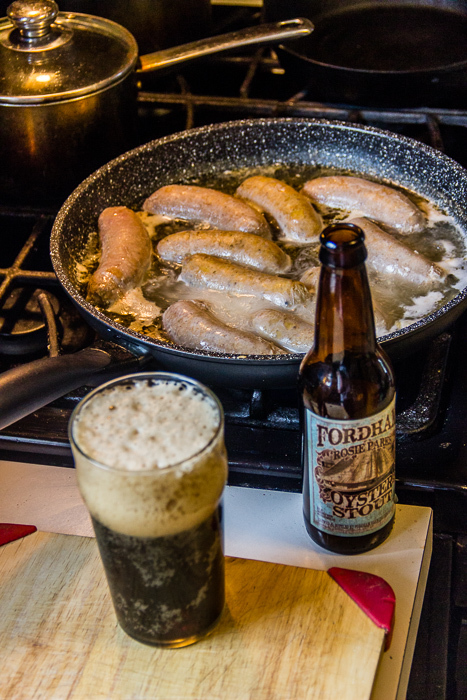 The beer, brewed with American 2-row along with cascade hops presents itself as a pretty straight forward pale ale, but has a slight spiciness that I think makes it an awesome food beer, whether you’re serving hotdogs, burgers, crabs, shrimp, or pulled pork. 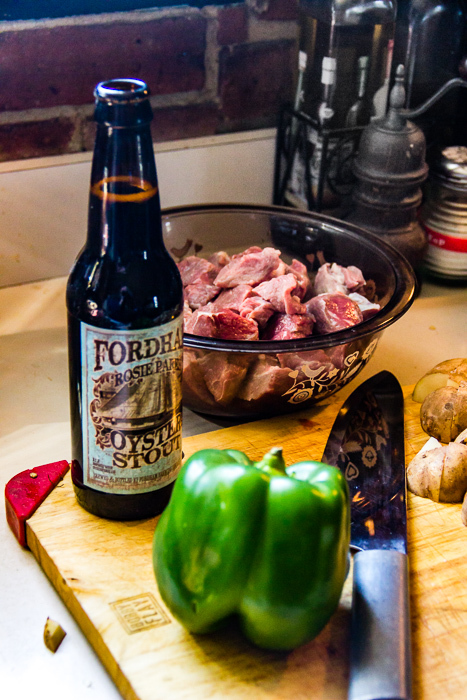 It’s probably not going to go toe-to-toe with huge, deep BBQ sauces, but really, does it need to? Sometimes you just need something to cleanse your palette with before your next bite of ribs or BBQ chicken. I’ll admit, I’ve been drinking the crap out of this beer all summer. 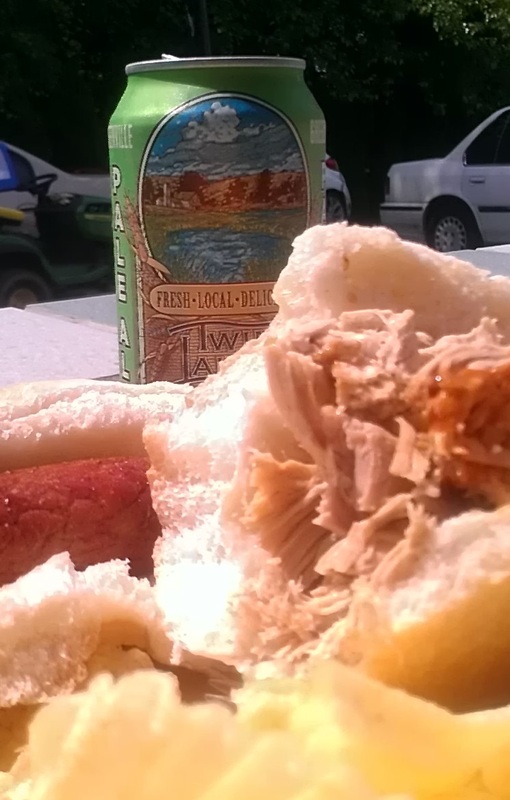 Twin Lakes was also nice enough to package Greenville in the tailgate friendly can. Bottle snob? Get over it. Ok, so I’m going to cross into Bryan’s “it’s OK, but I really wish you wouldn’t” territory. But I think with good reason. It’s summer as I write this, and in Delaware summer for many people means one thing – beaches. Every weekend all summer long, thousands of people brave the congestion that is “beach traffic” to claim their own small spot on our sandy shores – whether it’s in Rehoboth, Bethany, Dewey or Lewes. Many go for the sunshine and salt water, many go for the night life, and some just go for the Grotto Pizza (where Tracey slaved her summer, college youth away), Thrashers Fries and Snyders Candy. And of course, everyone needs a good beach beer. Why not Old Dominion Brewing’s Beach House Golden Pilsner? 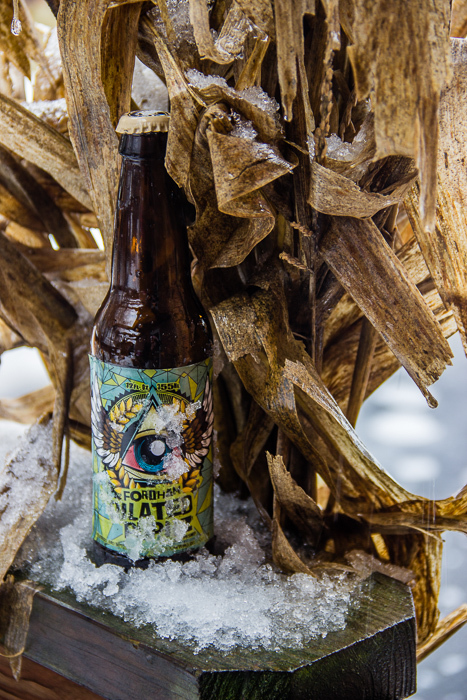 A Bohemian style Pilsner, brewed with Tettanger, Perle, and Saaz hops, this beer has an awesome crispness in the back that is really the highlight. 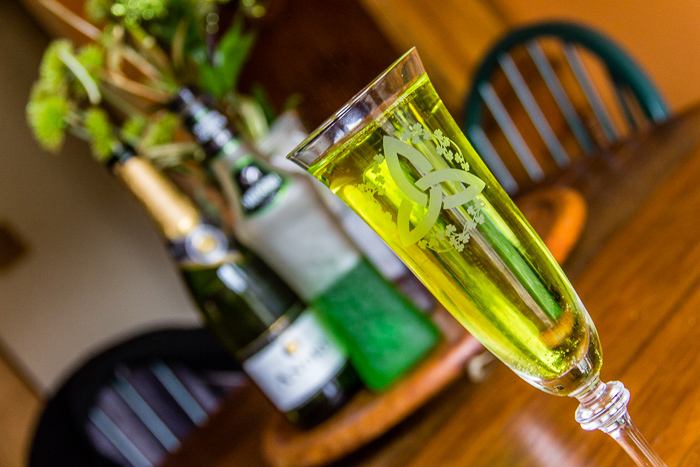 The nose is subdued, with a slight touch of grassy hops and what comes across to me as honey. The malt is there, light, almost bready. Plainly said, this is a rock solid pilsner, and is a perfect beer for washing the beach heat out of your mouth. It probably would also go well with a slice of Grotto’s pizza. If Stouts represented the Baldwin family of actors, than the oyster stouts would be the youngest (the first record of oysters used in the brewing a stout was until 1929) brother Stephen. Good, serviceable, and for some reason someone that no one thinks of until they see him and go, “oh yeah”. Many people cringe at this style and really shouldn’t. 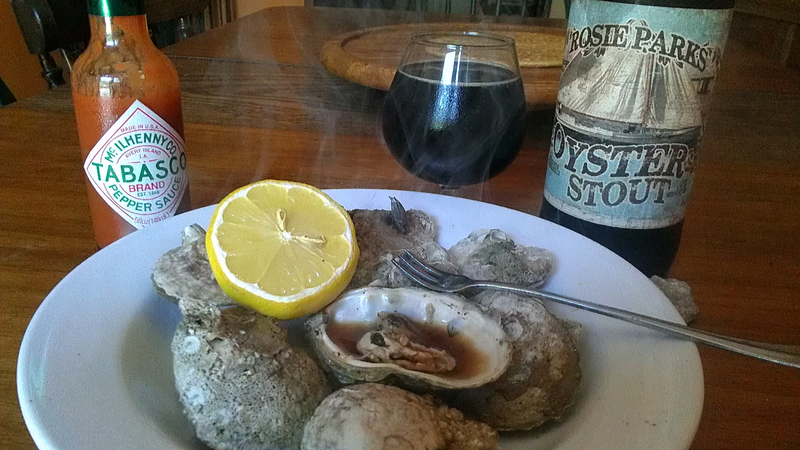 When done properly oyster stouts are smoother, less dry than their well known brothers and are just a pleasure to drink. And Fordham’s is done properly. Rosie Parks (which is named after a legendary skipjack that once dredged for oysters on the Chesapeake Bay) is built on a grain bill of CaraMunich, Wheat, Chocolate, and Roast; and hopped with Bravo and Glacier. Rosie is pure smooth drinking from front to back, with light chocolate and (even lighter) roasted notes, along with that kiss of mineral that comes from the added oyster shells. The finish is clean and not bitter (24 IBUs) and the after taste is simply a slight roastiness. This is one of my favorite styles of beer and I happen to know that it’s also a favorite of Michael Stiglitz, owner of Two Stones Pub. So I think that puts me in good company. The skipjack Rosie Parks is currently being renovated by the Chesapeake Bay Maritime Museum. And that leaves me with one more. Oh yeah, I could give you another DFH beer, but let’s be honest, if you ever get to my little state they will probably be on your list anyway (and to that end I recommend Theobroma, Hellhound on My Ale, Chateau Jiahu, and any of the continuously hopped beers, especially 120-Minute if you can find it). So instead I’m going to suggest a beer that you might actually walk past, but definitely should not. A while back, Old Dominion released a beer called GiGi’s Farmhouse Ale. The beer was only distributed in 22oz bottles and as a nod of these size bottles being known as “bomber bottles”, OD’s label artwork payed homage to the old pin-up woman and bomber-nose paintings of World War Two. Soon, Double D IPA and Morning Glory (an espresso stout) joined the line up. The beers were so well received that OD released Double D and Morning Glory in 12oz six-packs, and later bottled GiGi’s in 12oz bottles to include it with the other two as part of a “Pin-up 12-pack”. GiGi’s will be replaced in September with Candi, a Belgian Tripel. Double D IPA is built on Pale, Munich and Chocolate Malts, and hopped with Zythos, Crystal, Citra and Bravo. The beer has a light floral/grapefruit nose. The taste is well balanced, with the hops slightly out front, but it’s probably close enough to be a photo finish. The hops are again grapefruity, a touch of rind, and some pine that builds up after a bit. The 90 IBUs gives you a light kiss at the end, but nothing harsh, or creepy. Double D manages to hide it’s 10% ABV pretty well. So mark her “D” for dangerous. Double D is solidly constructed and a damn fine IPA. If you get a chance to pass through our state, don’t miss the chance to pick her and her sisters up. You’ll be glad you did.